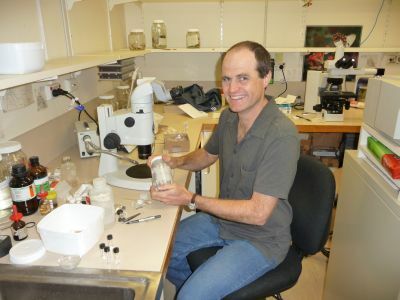 Dr Owen Seeman is the Collection Manager for Arachnida at the Queensland Museum. He is responsible for the care of the collection, scientific loans of specimens, and identifications. 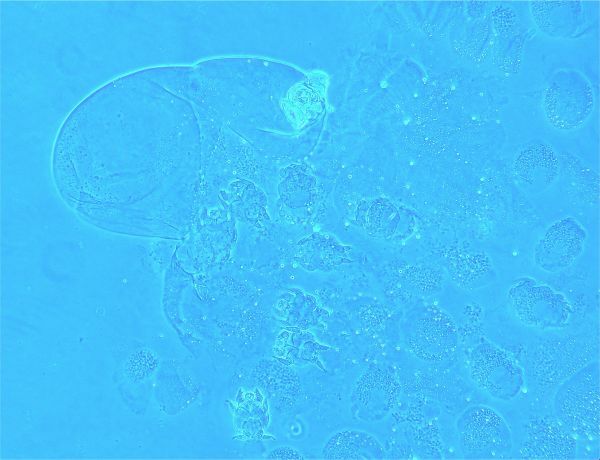 Owen’s main research area is the taxonomy of mites that live on and in insects. Mites are amazing animals. They are arachnids, so they commonly have 4 pairs of legs. They can live anywhere imaginable and their life cycles are very diverse. They are found in some of the most extreme habitats on Earth, from the deserts of the Sahara to the frozen wasteland of Antarctica. Some mites live in the lungs of snakes, the eyeballs of bats, the sub-cutaneous fat of pigeons, and around the anuses of sloths. Most of us have one species of mite that lives amongst our hair follicles and many people even harbour a second species. Owen has been investigating mites that infest under the elytra (the outer wing) and tracheal system (breathing tubes) of some beetles. These mites are sexually transmitted. i.e. move from beetle to beetle when the beetles reproduce. In some species the male mites have their genitalia on their ‘rear ends’ and in others it is found just behind the head – very unusual designs! 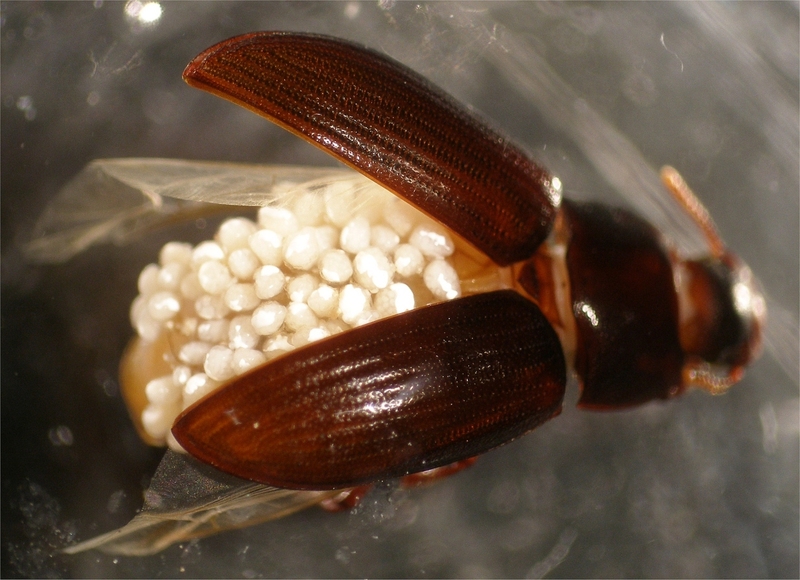 The mites seem to have limited effect on the beetles, as most parasites do. (After all, if a parasite kills its host, then it has lost its ‘meal ticket’!) However, over winter, mites can kill their hosts as they rest through the lean times. Once the warmth and wet of spring arrives, some infected beetles live long enough to mate with their offspring generation, and so the next lot of beetles is infected with mites. Over the course of evolution, some parasites tend to simplify their ‘body design’. 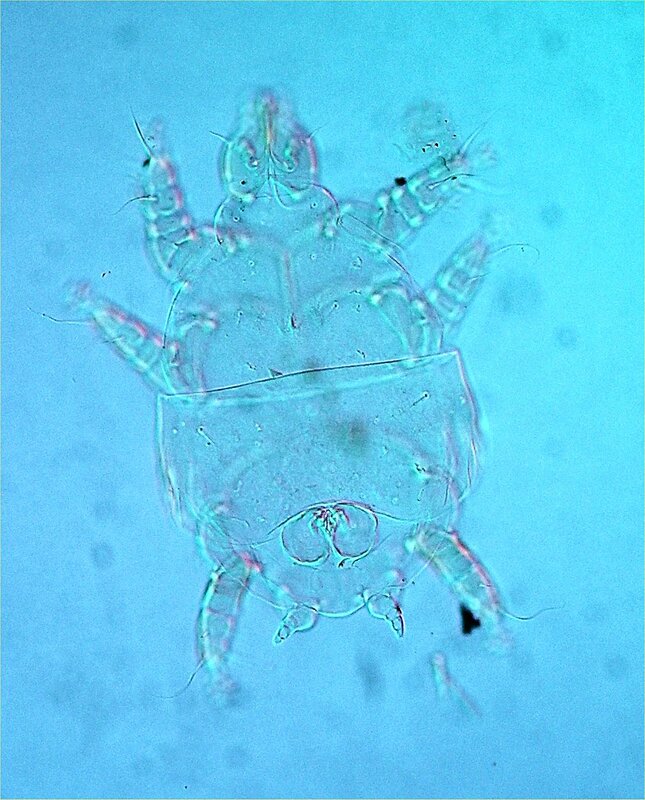 In some podapolipid mites, the female has only one pair of stumpy legs and has become nothing more than a fat bloated sac filled with squirming young. When this mite (below) was slide-mounted, we can see that the males have developed first, as there were no developed female larvae (yet). 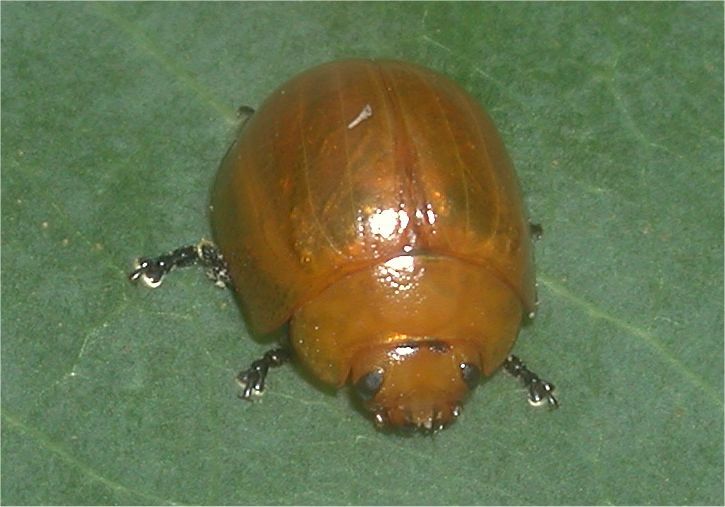 The female larva mates (presumably with brothers inside their mother, then other males once born) and then transfers to another beetle when the beetles mate. On her new host she turns into the adult female and the circle of life continues! The beetle Paropsis atomaria is a pest of eucalypt plantations in Queensland. 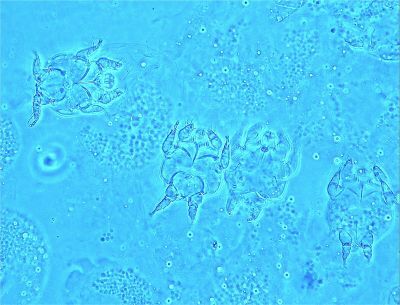 It has three species of Chrysomelobia mite that infect it. The species C. lawsoni lives in the tracheae of the beetle, while the other two species live under the wings only. 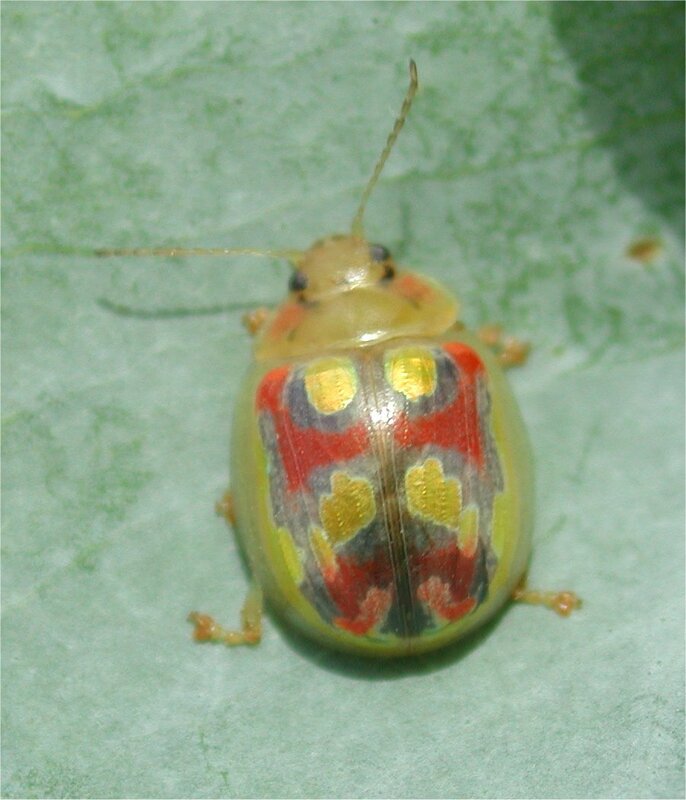 Paropsisterna nobilitata is a beautiful beetle that has one species of the mite Chrysomelobia living on it. Paropsisterna cloelia is one of the pest species of eucalyptus in Queensland, which also has one species of Chrysomelobia mite living on it. 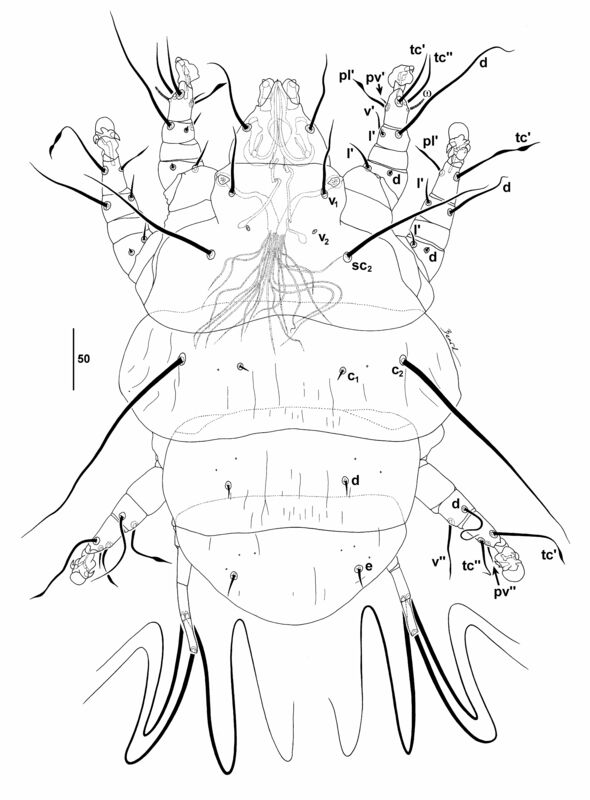 The drawing below of the adult female of Chrysomelobia lipsettae, shows you that on a mite, every hair has a name. To read more about the work that Owen does, visit his Biography page. To learn more about spiders and mites, visit the section on other Arachnids and Myriapoda on QM’s website. Previous PostNew Primary Science Loans Kits Trialled in the ClassroomNext PostBehind the Scenes – Cheap Dust Collector or Expensive Treasure? Need your kind helps. I am not a mite taxonomist. Could you kindly review my manuscript on varroa mites. I use SEM to observe external morphology of varroa mites. Looking forwards your kind help.